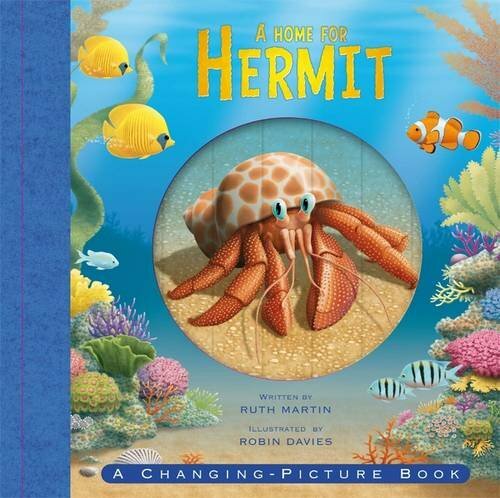 Young children will quickly sympathise with Hermit’s problem: he has outgrown his shell and needs to search the coral reef for a more roomy home. As this young crab’s journey proceeds, the creatures that inhabit the reef are introduced in a most engaging way: shells including pink scallops are seen on the sandy seabed, anemones inhabit rocks and interestingly patterned fish dart about in the busiest part of the reef. The underwater environments are shown in wonderfully vibrant colours and invite questions and comments. There is humour too: for example when the scallop shell that catches Hermit’s eye turns out to be occupied already and when the sponges with their promising hidey holes are, on further investigation, full of shrimp snapping their claws. ‘No space for me here then, I see,’ Hermit exclaims diplomatically. Ingenious paper engineering is often encountered in children’s picture books these days. Here the picture changing gatefolds work extremely well, revealing the interiors of anemones and sponges. They are robust enough to stand up to realistic use too.